Metropolis, opened in 2009, has 82,000 square meters of retail space and 2,900 square meters of parking. 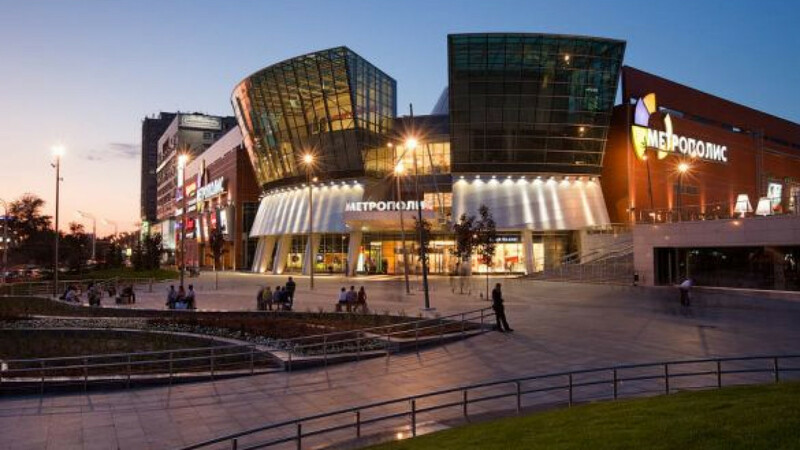 The domestic commercial property market received a massive cash injection with the sale of one of Moscow's largest shopping centers, Metropolis, to Morgan Stanley's real estate investment unit for a record $1.2 billion. Morgan Stanley Real Estate Investing acquired the 205,000-square-meter shopping center in northwestern Moscow from developer Capital Partners. "The acquisition is the largest-ever transaction in the Russian commercial real estate market," the New York-based company said in a statement Friday. The sides involved in the deal didn't disclose terms, but a source familiar with the matter said the transaction was worth $1.2 billion. The source declined to be identified, noting that the conditions of the deal are confidential. "The acquisition is consistent with our strategy of investing in high-quality assets in Russia, a market that should continue to benefit from strong growth in consumer demand," Brian Niles, head of the Morgan Stanley unit for Europe, Middle East and Africa, said in the statement. The purchase of Metropolis is the biggest transaction since the first big investment deals in the commercial property market, in 2003, said Alexander Zinkovsky, a senior analyst at Cushman & Wakefield. The deal beats the same Morgan Stanley unit's purchase of the Galeria shopping center in St. Petersburg last year for about $1.1 billion. The two purchases are expected to "deliver operational synergies and strategic benefits associated with owning two prime shopping centers in Russia," Niles said. The acquisition of Metropolis is "an outstanding start of the 2013 investment year," said Tom Devonshire-Griffin, head of capital markets at Jones Lang LaSalle, which advised on the deal. Buying the Metropolis and Galeria shopping centers "provides a clear evidence of investor interest in retail schemes becoming more favorable for foreign and domestic purchasers," he said by e-mail. The domestic retail property market remains attractive for investors, since consumer spending on average accounts for up to 70 percent of Russians' incomes, Zinkovsky said. That means a high-quality shopping center with a good location and a bundle of high-profile tenants usually generates good revenue, making it an interesting investment option, he said. Russia saw a record $2.6 billion in retail property investment last year, and this year's projection stands at about $3 billion, Cushman & Wakefield estimates. Zinkovsky said more investors are heading to the regions, with 1.6 million square meters of retail space expected to be completed this year. Moscow is likely to see 180,000 square meters of new retail properties, up from last year's figure of 152,000 square meters, he said. Metropolis, which opened in 2009, has 82,000 square meters of retail space and 2,900 square meters of parking. It was one of the most-visited shopping centers in Moscow last year, receiving 55,000 customers daily, Morgan Stanley said in the statement. What Kind of Welcome Awaits Outlets?